WHAT CAREERS WILL BE GOOD THROUGH 2033? Many sources tell which jobs and careers have high pay and many opportunities. They do not try, though, to show which positions will succeed in the future. Automation, globalization, and efficiency will barely touch some, but will devastate others. Scientific and social progress will make various opportunities more plentiful and will cause others to go away. Some employing few today will demand many tomorrow, and the opposite is true for others. But which jobs and careers, specifically, will stay and justify the education, preparation, and training time and money in this declining job market? The jobs crisis is permanent. Many positions around for a long time, such as postal service workers and telephone operators, have lost at least a tenth of their workers since 2000. Others, for example glaziers, market researchers, and physical therapy assistants, have gained greatly. A connection with technology has been no guarantee. Computer operators and semiconductor processors, to name two, have been decimated, and personal care workers and iron and rebar workers have gained handsomely. On which jobs will flourish over the next 20 years, the past is no guarantee. Some positions recently adding workers, such as database administrators and pharmacists, project to be slashed before today’s graduates even approach middle age. Others, for example aerospace technicians and food service managers, have dropped lately but are poised for comebacks. A new book, released May 13, 2013, reveals the jobs and careers most worthwhile for the next 20 years. Choosing a Lasting Career: The Job-by-Job Outlook for Work’s New Age provides a detailed, multiple-perspective look. It names the prospects, advantages, and disadvantages of 506 jobs and 25 entire careers. It assesses our national work situation, and shows what it means for career choices. The book also addresses self-employment as it really is, and alerts us to related, stunning events probable in the decades to come. It is comprehensive, broad-based, and well-grounded not only in the past and present, but especially, and uniquely, in the future. Choosing a Lasting Career fills what had previously been a gap between personality career assessment and the tactics of job-seeking. 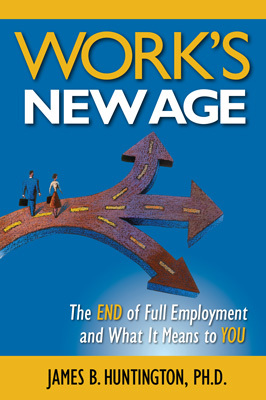 James B. Huntington also wrote 2012’s IPPY-winning Work's New Age: The End of Full Employment and What It Means to You. His 2007 dissertation, Prospects for Increased Post-65 Career Employment for the Baby Boom Generation, is the only book ever published on that subject. He is also creator and keeper of the AJSN (American Job Shortage Number), the key economic indicator showing latent demand for American jobs. He has a B.A. in sociology, an M.B.A., and a Ph.D. in Applied Management and Decision Sciences from Walden University. His description of the thesis of Work’s New Age was the subject of the New York Times’s Sunday Dialogue on May 19, 2013. He has also been a business professor, teacher, and professional speaker, and has written scholarly works on leadership, organizational change, and human development. Choosing a Lasting Career is available on www.amazon.com and www.barnesandnoble.com, at bookstores (on the shelves or special-ordered through Ingram Book Company), and directly from the publisher at www.royalflushpress.com or 845-456-0115. Kindle and Nook electronic versions are also on the market. Choosing a Lasting Career: The Job-by-Job Outlook for Work’s New Age by James B. Huntington. Original edition. 8½ x 11, 192 pages, 29 figures. ISBN 978-0-9835006-7-4. $14.95. See pressroom for a 300 dpi JPEG of the cover.